In recent years, branched-chain amino acid supplements have made a comeback in the bodybuilding and fitness communities, and with good reason. 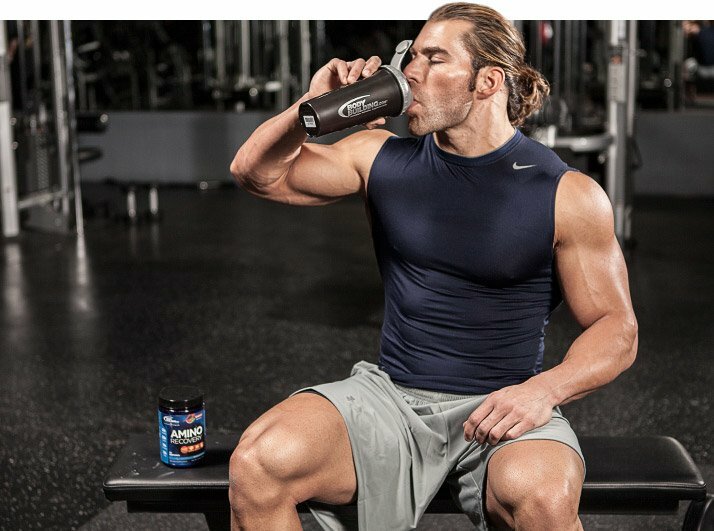 There's more research that supports the use of BCAAs than most other supplements on the market. While BCAA supplementation may be useful for gaining skeletal muscle (the kind that makes you swole), BCAAs are especially helpful for maintaining mass while on a calorie-deficit diet. They're particularly useful for bodybuilding competitors who take their physiques to the lean extreme. Although dieting down makes you look awesome onstage, on the beach, and to your friends, it can also take a chunk out of your muscle mass. Dieting is catabolic, which means it can lead to muscle breakdown, for several reasons. The leaner a body gets, the more likely it is to lose skeletal muscle as the body tries harder and harder to hold on to body fat stores. In doing so, a side effect is that the body will turn to muscle to satisfy its energy needs. Bad news for anyone interested in a hard body. On the molecular level, muscle loss occurs because the body increases protein breakdown (catabolism) in order to liberate muscle amino acids for metabolic fuel. If this isn't bad enough, muscle loss is compounded by the fact that levels of muscle protein synthesis will also decrease due to reduced energy intake. The basic equation for muscle mass is: Muscle mass = rate of protein synthesis - rate of protein breakdown. When the rate of synthesis equals the rate of breakdown, you don't gain or lose muscle. If the rate of synthesis is higher than the rate of breakdown, you get muscle growth. When the rate of breakdown is higher than the rate of synthesis, you lose muscle. If you're dieting, you may be burning the candle at both ends: raising muscle breakdown and lowering protein synthesis. Working out compounds the metabolic effects of dieting. The leaner you get, the more lethargic you can become. Decreased energy intake and glycogen storage make for some rough training sessions. If you're too tired or weak to lift as heavy as your body is used to, your muscles will adapt, and they won't use as much energy to get the work done. That leads to two metabolic problems: You won't increase skeletal muscle, and your body could use the lean muscle you do have for energy because you aren't using it to lift a heavy load. Here are the ways branched-chain amino acids can help you stay swole when you're dieting. Branched-chain amino acids (which are the essential amino acids valine, isoleucine, and leucine) stimulate muscle protein synthesis, potentially more than a normal protein on its own. Protein synthesis is the metabolic process when your body makes new muscle protein, also known as gains. If we revisit our original equation for muscle mass, it's plain to see that increasing synthesis and decreasing breakdown will equate to muscle gain or maintenance. Amino acid supplementation could also help you get a more intense workout. Branched-chain amino acids compete with the amino acid tryptophan for entry into the brain, where tryptophan can be converted to the neurotransmitter serotonin. During exercise, serotonin levels rise and can make you feel more fatigued, meaning you won't be able to push as hard. BCAA supplementation reduces the amount of tryptophan that gets through the blood-brain barrier, and therefore reduces the amount of serotonin produced. This might allow you to work harder, longer, and get more gains. Despite all these benefits of BCAA supplementation, there are many skeptics who say branched-chain amino acids are overpriced and you can just get them from whey protein. While proteins like whey are naturally rich in BCAAs, this isn't the most effective strategy for muscle growth or fat loss. The BCAAs in whey are peptide-bound to other amino acids. In order to raise BCAA levels in your body, they must be liberated through digestion and then absorbed into the bloodstream. Even though whey protein is relatively fast digesting, it still takes several hours for all the amino acids to be broken down and absorbed into the plasma. Branched-chain amino acids in supplement form, however, are free-form, require no digestion, and are rapidly absorbed into the bloodstream. They spike blood amino acid levels more quickly and to a much greater extent than peptide-bound aminos in proteins. Even a few grams of free-form BCAAs will spike BCAA plasma levels way more than 30 grams of whey protein. They can start working right away. Branched-chain amino acids play an important role in regulating glucose. They are continuously released from the liver and other internal organs to skeletal muscles to maintain blood sugar levels. Having enough of these amino acids in the body can help improve glucose uptake and insulin sensitivity in healthy people. These essential amino acids are responsible for a large portion of blood sugar production during workouts. This is important to note if you work out in a fasted state or if you're on a calorie restricted diet. When you have a balanced carbohydrate, high-protein, and amino acid beverage during and post-exercise, this can induce an insulin response. The insulin response helps transport aminos into cells to repair muscle damage and build muscle tissue. You're basically replenishing the anabolic building blocks that your body needs to repair itself post-workout and reduce delayed onset muscle soreness. Essential amino acids include all the amino acids that cannot be made by the body, including BCAAs. You must get them from protein foods. There are nine essential amino acids: histidine, isoleucine, leucine, lysine, methionine, phenylalanine, tryptophan, and valine. Your body can make non-essential amino acids by itself from vitamins and other amino acids. The term "non-essential" can be misleading since all amino acids are essential for proper metabolism and certain non-essential amino acids, such as glutamine, become very essential during illness or trauma. The 13 non-essential amino acids are alanine, arginine, aspartic acid, cysteine, cystine, glutamic acid, glutamine, glycine, hydroxyproline, proline, serine, and tyrosine. So how do branched-chain amino acids factor in with your diet and other supplements? The standard dosage for isoleucine is 48-72 milligrams per kilogram of body weight and the recommended dosage for leucine is between 2-10 grams. This equals about 20 grams of combined amino acids with a balanced ratio of leucine and isoleucine. This would be the equivalent of consuming natural sources of protein such as meat and eggs at a ratio of 1-1.5 grams of protein per kilogram of body weight per day. But remember, to get the immediate effects of branched-chain amino acids on your plasma BCAA levels, take them on their own instead of just getting them from foods. Monitor your dosage accurately. Excessive amounts of BCAA supplements can overstimulate insulin signals causing insulin resistance. Many studies have been conducted to monitor the safety and effectiveness of branched-chain amino acids. A study at Leeds Metropolitan University in the UK found that supplementing with leucine during a resistance training program enhanced strength performance. A team of researchers from the University of Orleans in France found that during a long endurance trial, athletes who took high levels of mixed branched-chain amino acid supplements (including valine, leucine, and isoleucine) reported feeling less tired. Athletes who took the placebo reported feeling more tired and having more memory errors. Other reports found that proteins involved in muscle catabolism (exercise-induced muscle breakdown) appeared to be suppressed following BCAA supplementation. The researchers think this is an indirect function of muscle protein synthesis. The Graduate School of Bioagricultural Sciences at Nagoya University in Japan also tested the effects of BCAA supplementation. Their findings show that taking BCAA supplements before and after exercise is effective for reducing post-exercise muscle soreness. Whether your goal is muscle building or weight loss, supplementing with branched-chain amino acids (leucine, isoleucine, and valine) can support the metabolic processes that make it happen. They can also make your gym workouts more effective. You can get these amino acids from foods, but dietary BCAAs won't hit your blood plasma as fast as BCAA supplements. Add a BCAA supplement to your routine! You can take it before, after, and/or during your workout. You can also sip on these amino acids between meals to stay in an anabolic state as much as possible. Amino acids: Amino acids are the compounds that are the building blocks of protein. There are essential amino acids and non-essential amino acids. You get them from eating protein, and they are what your body uses to build muscle protein. Branched-chain amino acids (BCAAs): BCAAs are a class of essential amino acids that the body can use for energy and muscle synthesis. The branched-chain amino acids include leucine, isoleucine, and valine. Catabolism/Catabolic: Catabolism is another name for muscle tissue breakdown. This is what happens when your body dismantles muscle tissue to use as fuel. Being in a catabolic state means this is how your body is getting energy. Glucose: Glucose is the form of sugar that is in our blood, also known as blood sugar. You get this from eating carbs, but the branched-chain amino acids isoleucine and valine can also be converted into glucose. Insulin: Insulin is a hormone made in the pancreas that helps the body turn glucose into energy. Protein synthesis: Protein synthesis is when your body makes new muscle protein, also known as gains. Ispoglou, T., King, R. F., Polman, R. C., & Zanker, C. (2011). Daily L-leucine supplementation in novice trainees during a 12-week weight training program. International Journal of Sports Physiology and Performance, 6(1), 38-50. Borgenvik, M., Apró, W., & Blomstrand, E. (2011). Intake of branched-chain amino acids influences the levels of MAFbx mRNA and MuRF-1 total protein in resting and exercising human muscle. American Journal of Physiology-Endocrinology and Metabolism, 302(5), E510-E521. Shimomura, Y., Inaguma, A., Watanabe, S., Yamamoto, Y., Muramatsu, Y., Bajotto, G., ... & Mawatari, K. (2010). Branched-chain amino acid supplementation before squat exercise and delayed-onset muscle soreness. International Journal of Sport Nutrition and Exercise Metabolism, 20(3), 236-244.